A bad circuit breaker is a major inconvenience, but there can be other issues at play when your power supply isn’t working the way it should. Breakers protect you and your home from current overloads and other electrical issues. If the circuit gets overloaded, the breaker will trip, cutting power to eliminate the risk of fire. Sometimes a breaker will trip even when there is no overload, but it can be tricky to figure out which situation applies. 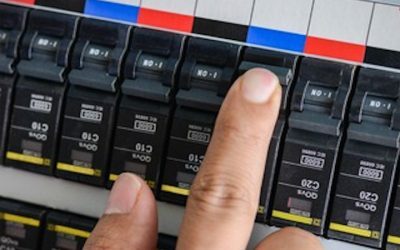 If you think you have a bad circuit breaker, look out for the following signs so you can get the problem taken care of quickly. If your breaker is tripping, it could mean there is a device on the circuit causing an overload. Identifying what circuit the breaker is protecting can help you figure out if the problem is with a device or with the breaker itself. There might be a label on the breaker panel that gives you this information, but if not, you can figure it out by testing your lights and devices. If you disconnect the devices connected to the circuit and try to reset the breaker again, the outcome will confirm whether you have a faulty breaker. If it still trips even without the devices connected to it, it is defective and needs replacement. If a breaker trips, its switch is then located in the middle, halfway between the on and off positions. When you reset a breaker, you simply have to move the switch over, so it’s off, and then shift it again so that it’s in the “on” position. If the breaker was properly reset, you should hear a distinctive clicking sound. In some cases, the breaker might trip again soon after being reset, which means there is too much electricity passing through it. If the breaker trips again right away, it could mean there is an issue with your circuit. The breaker could also be at fault, but the biggest warning sign would be if the switch doesn’t go to the “off” or “on” positions when you attempt to reset it. If it only moves back and forth without clicking, it is likely that your circuit breaker is bad. If you’re sure the issue is your circuit breaker, don’t hesitate to get the right help for your problem. This is the kind of issue that requires qualified professionals, so be sure to get in touch with us at Bryan Electric, Inc. today! Feel free to visit us online or call us at (770) 680-2144 with any questions you might have about your bad circuit breaker. Schedule an appointment so we can help you get back on track.